Buddha-Bar Manila, a world-class resto-bar-lounge that offers fine dining and entertainment experience, levels up the fun and excitement of the Easter Sunday celebration as it sets its exquisite place for a Magical Easter this April 16, 2017. “We are glad to invite everyone to come and celebrate with us at Buddha-Bar Manila with our Magical Easter event. We’ve always been doing this to celebrate the Easter Sunday; and this year, we made sure that it’s more magical, different, and spectacular,” said Bernadette Castillo, Sales and Marketing Head of Buddha-Bar Manila. Buddha-Bar Manila’s Magical Easter features an exciting lineup of activities that promises to make the celebration of the Easter Sunday for families more memorable than ever before. Among these is the Easter Bunny Trail that kids will surely enjoy. Participants of these activities will receive exciting prizes and giveaways. Magical treats will also be given away for the first 30 reservations. Aside from these, Buddha-Bar Manila also offers a sumptuous spread of delicious cuisines that will be served at the Easter Lunch Buffet. It opens from 11am to 2pm with free-flowing non-alcoholic drinks. The Buffet with Magical Play Pass is priced at PhP475 for kids, (ages 10 and below), and PhP950 for Adults. 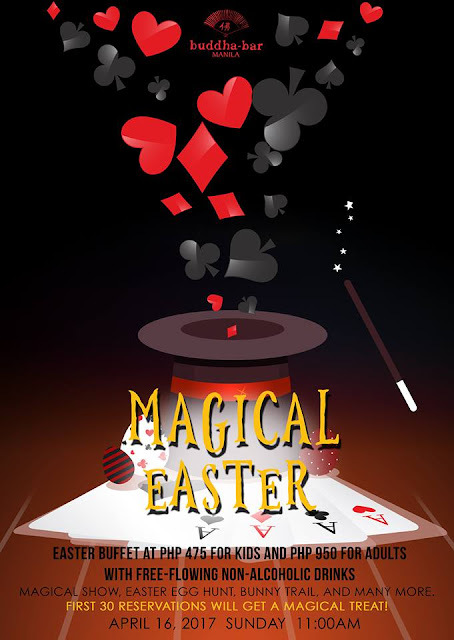 Part of the Easter festivities is the Search for the Magical Egg (Easter Egg Hunt), which will happen in the Magical Program at 1pm. The program also features magical shows and exciting games. 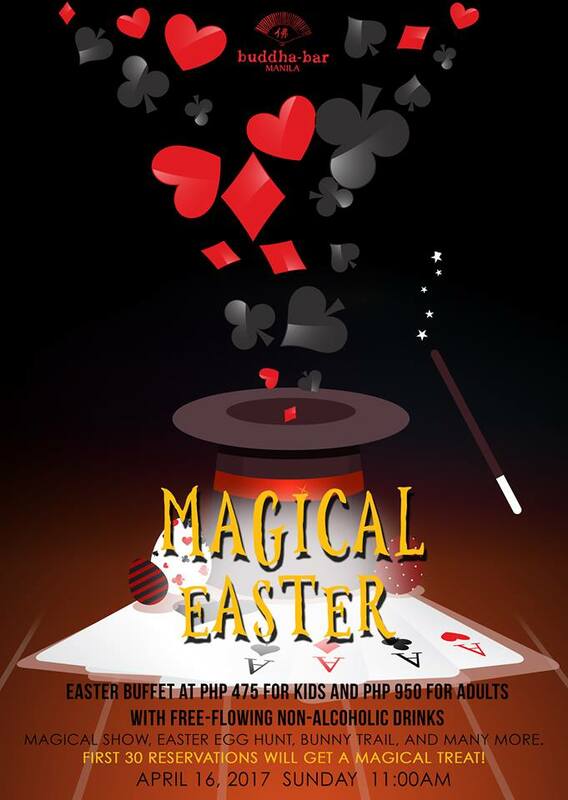 Kids can watch this magical extravaganza if they purchase a Magical Play Pass priced at PhP250 only. “This event is our way of treating our customers to an event that makes the most of the upcoming Easter Holiday. We encourage them to join us and spend a quality and fun time at Buddha-Bar Manila with their family and friends,” Castillo added. Since it first opened in 2012, Buddha-Bar Manila has been dedicated to offering different themed events for its customers. It also carries the sophistication and the world-class service offered by the Buddha-Bar International franchise, based in Paris, France. It has also brought the luscious taste of Modern Asian and Western cuisine. Buddha-Bar Manila is located at Picar Place, Kalayaan Ave, Makati City. For inquiries and reservations, please call 8566719, 8566859, or 09989833918.